Did you know that recent research shows there are currently over 3 billion active social media users? In fact, the average individual has more than five social media accounts and when it comes to businesses, 91% of brands use two or more social media accounts for marketing purposes. There’s no denying that a strong social media presence is essential to your brand’s success, but many businesses struggle when it comes to implementing a proper strategy for doing so. This is where social listening comes into play. Social listening can help you with everything from market research to product development, to enhancing your customer service experience and lead generation. Social listening can help you gain leverage against your competition, build strong relationships with your consumers and gain a foothold in your industry. But you have to know how to go about it in the proper manner. So, if you’re interested in learning more about social listening and how you can harness this tactic to build your brand and make an impact in your industry, then look no further than these next few lines. 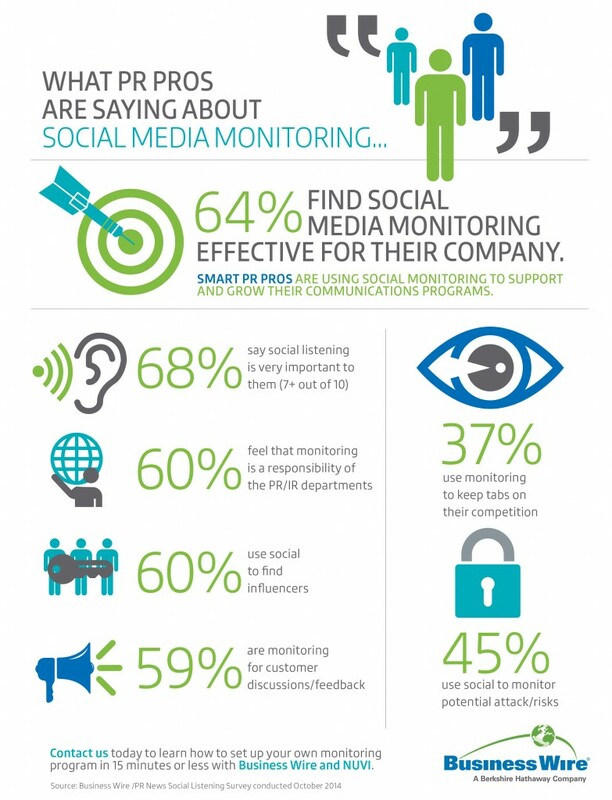 Social listening, also commonly referred to as social media monitoring, is the process of tracking digital conversations within the social landscape in order to gain insight on your customers and their opinions on your brand, products and industry. Marketing teams use social listening primarily for community management and gather various forms of data and information in order to influence their strategic goals. It’s important to understand that social listening also involves a high level of engagement in order to be effective. You can listen to your customers all you want, but if you’re not taking the steps necessary to show them you’re willing to also improve their experiences and opinions on your brand, then you can actually end up doing yourself harm in the end. Brands need to listen, but they also need to take charge. This is the key to success. So, why exactly is social listening important? Well, with 3.196 billion global social media users out there amounting to 42% penetration, it’s hard to see why not. Did you know that a whopping 95% of adults aged 18-34 are most likely to follow their favorite brands on social media and that 71% of consumers who have had positive social media experiences with a brand are likely to recommend that brand to others? Even more interesting is the fact that according to recent research, Facebook alone has influenced 52% of consumers’ purchases both online and offline. 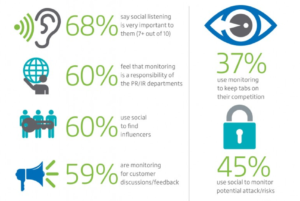 Social listening isn’t just a strategy for community management, it’s absolutely essential to the success of your brand as a whole, especially in 2019. Using social media listening is an excellent way to help your company identify weak spots in your competition. For example, you could use a tool or platform such as Twitter Advanced Search or Meltwater to monitor keywords specific to consumer frustrations with your competitors and then follow up accordingly with a strategy based on your findings. Terms such as “[Competitor’s name] can’t” or “[Competitor’s name] problem” can help you sift out common pain points and thus give you leverage in your strategies. Social media listening is a great strategy for lead generation was well. For example, brainstorming keywords and phrases that prospective customers might use when researching products or services within your niche and tracking these terms across various forums and social groups can provide your business with endless opportunity. Google’s keyword planner is an excellent tool for conducting keyword research. Ahref’s keyword explorer and KeywordTool.io are other extremely popular alternatives in the industry. Influencer marketing is no doubt one of the most significant trends to emerge in the industry within the last few years. But did you know that you can use social listening to help scout important individuals within your niche? Of course, influencer agencies are extremely helpful, but they aren’t indispensable. You can track influencers within your niche by tracking links or titles of various press releases or posts and seeing who’s sharing them. You could also track industry terms and identify influencers who specialize in your niche and then establish and build relationships with them through engagement and rewards like giveaways or special offers. Okay, so you understand your target demographic, but do you know where the bulk of your consumer base hangs out online and carries out important conversations? Is it Twitter? Reddit? Facebook? Quora? Popular community forums and blogs are also various places where individuals tend to gather within a community. Track these conversations by monitoring specific keyword phrases to identify consumer group hot spots and then join in on the conversation. Sprout Social is an extremely popular platform which offers advanced social media listening and even gives users convenient data repots in PDF and CSV format. Using social media listening to monitor both positive and negative feedback is a great way to gain insight on your brand’s reputation and fuel your strategy for marketing, product development or customer service. Monitor your website mentions, brand name and also any potential common misspellings of it. It’s also important to remember to nix the “@” symbol when doing this as many people forget to add it when communicating online. 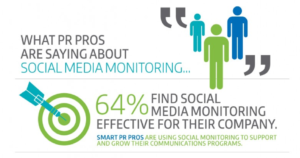 When it comes to social listening, it’s essential, but even more important is engagement. Monitor conversations with popular platforms such as Hootesuite’s, but be sure to respond genuinely and efficiently to any potential issues or negative feedback and definitely be sure to give thanks to the praise. 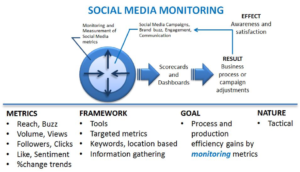 Okay, so now you understand the fundamentals of social media monitoring and you are well-versed in the numerous benefits it can offer your business. But how do you go about crafting a social listening strategy? Well, we’ve compiled a list of six essential steps necessary for those looking to create an effective social media listening strategy. 1) Identify your target demographic. Let’s face it – you can’t just listen in on any and every conversation and sometimes it may be more advantageous to listen in on a specific segment of your target demographic as opposed to your base in its entirety. Regardless, identifying your ideal consumer demographic and creating detailed customer personas are going to be imperative to your success. Tools such as Twitter Advanced Search, Facebook Page Insights and Consumer Barometer are great options for the task at hand. 2) Determine your strategic goals. 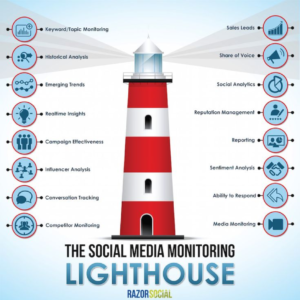 What exactly are you attempting to accomplish with social listening? Are you trying to gain a better understanding of your competition? Perhaps you’re trying to increase brand awareness within your community or measure the impact of your marketing campaigns. Or maybe, these are all goals you’re interested in accomplishing with social listening. Identify what it is you are looking to achieve and then you can work your way back from there in terms of strategy and tactics. 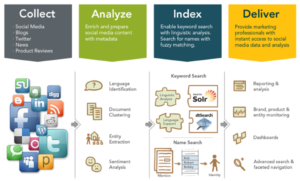 3) Decide how you will use the data you gather. It’s also essential to figure out exactly how you are going to use the information and insights you gain from social listening to inform your strategies. Create a step-by-step plan in order to establish protocol and remain efficient and effective in your efforts. 4) Create a keyword list. Social media listening revolves around keyword phrases. Your keyword list is the key to your success in navigating the social landscape and as a result, you should do your due diligence when it comes to researching the phrases necessary to achieve your strategic goals. Lucky for you there are numerous tools and platforms available to assist you in this endeavor, such as Google Trends – a great tool for analyzing search queries which can help you find out exactly how people are searching for your brand or your competition. Whether you’re a small agency or startup with a handful of employees or a large and established brand within the market, you’re going to have to be quick on your toes when it comes to engagement. In fact, recent research by Lithium found that 78% of individuals who complain to a brand via Twitter alone expect for a response within an hour. Social media listening and engagement is done in real-time – there’s no winging it here – and as a result, you’re going to have to make sure you have a team prepared to handle the task. 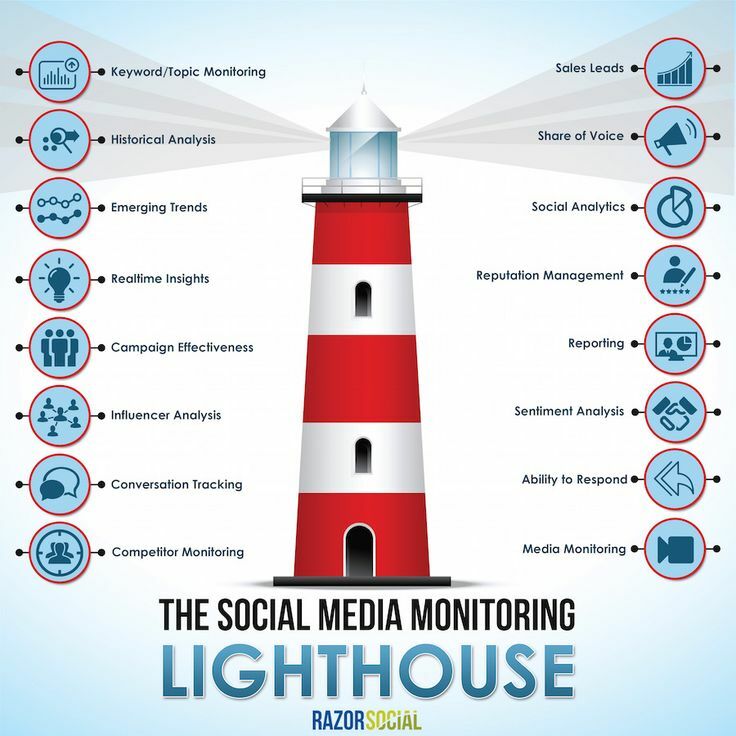 Tools such as the ever-so-popular Social Mention offer real-time social media search and analysis on trends and industry insights. 5) Invest in the proper technology. Whether you’re looking for free platform options, cost-effective tools or an entire suite, you’ll need to do your research when it comes to investing in the proper technology for the job. The quality of your research will have a significant impact on your resources and effectiveness and so you’re going to want to make sure you have chosen the tools that make the most sense for your particular situation. Many platforms and forums such as Reddit and Quora are absolutely free. Others such as Social Bakers offer free trials and reports to potential customers. With SocialBakers, you can even get a free Facebook performance report to gain insight into the effectiveness of your Facebook marketing strategy. All you have to do is add your page’s URL or the URL of your competition to get on board. So, there you have it! Everything you need to know about social listening and how it can positively impact your business and its success. Social listening can help you with everything from competitive intelligence to lead generation, to community management and enhancing your customer service experience. It is our hope that you’ve found value in this article and that you will leave us with a greater understating of this impactful trend and its numerous benefits. So, get out there, work up a strategy, and get on the road to building a stronger brand and carving out your footprint in the industry today. What are some social listening tools you’ve utilized in the past? Let us know your thoughts in the comment section below!